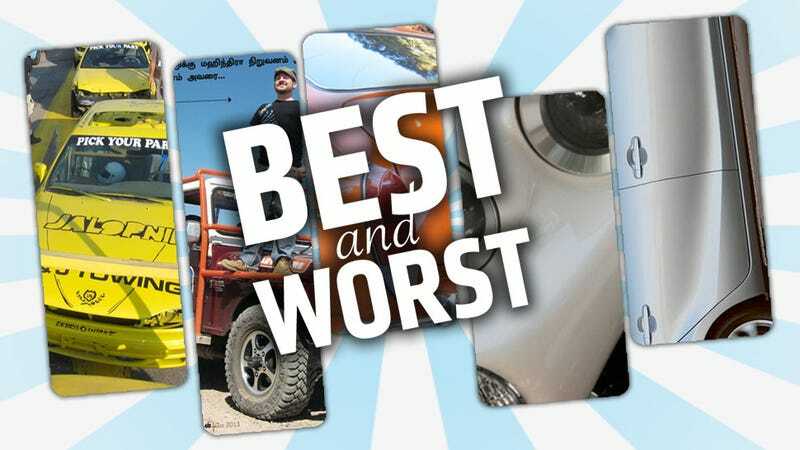 You may not have realized it, but today is the biggest betting day for Vegas bookmakers: The day I announce my Best and Worst Cars I've Driven this year. Fortunes will be made or broken today, pals, so I hope you bet well. This was a tricky year to pick from, since I drove so many interesting cars. But, like a nose crammed with crispy, sharp boogers, pick I must. And with shameful glee. I got behind the wheel of a huge variety of cars this year, from tiny two-cylinder Indian vans to house-priced supercars. And while some of these cars are clearly superior to others, the filter of my wildly questionable taste made the results likely a lot different from what you'd expect a healthy, functioning person's to be. Okay, enough qualifiers — let's see where this ended up. I can't wait to find out! At least this one was easy to pick, because it's hands-down the car I had the most intense fun in of any car this year. On paper, you wouldn't think this car would really be that appealing: XV10 Toyota Camry, somewhere between '91-'96, four-door sedan, FWD, boring, anonymous. But, it had three big advantages: first, it was yellow, my car color of choice; B, it had no rear wheels, just steel plates welded to the rims; and gamma, I drove it on a track with about 40 other loons in similar cars. It would spin if you so much as imagined a cake in your head, since "cake" sounds like "brake" and anything at all to do with brakes made it spin, very rapidly. It shot sparks, made awful noises, and once you figured it out, drifted around the track like a figure skater. An amazing experience. Everyone should drive a skid plate car at least once. It was tricky picking a best car from my India trip, but I think I have to pick the Jeep's tougher ex-con brother, the Mahindra Thar. I drove the Thar in an off-road rally through the Rajasthan desert, and in that process came to really respect the car. It's an absolute brute, but manages to be manageable to drive. It's a manual, diesel Jeep with amazing torque and a surprisingly good air conditioner. It's rugged and simple and was an absolute blast to climb up sandy dunes in and plummet down what felt like cliff faces. Sure, mine had a ridiculous orange roll cage that may or may not have been useless, but I have nothing but respect for the mighty Thar. Though it was much less terrifying driving it down a sand dune than on regular Indian roads. I drove a lot of great classic cars this year, and I can say without hyperbole that each was fantastic in its own way. But for some reason this slow, immaculate, and very very orange VW Type III Fastback stands out, mostly because of the intensity of love the owner felt for the car. Almost every classic car owner feels a strong bond with their cars, but I think what struck me most about the relationship between Joy and her Type III is that she wasn't necessarily a car person otherwise, but she had still developed a strong bond with this unusual bit of German iron all the same. It made me think a lot about why we value our cars so much, and that's why I picked this VW. Honorable mention: The Zelectric Bug was a very impressive experience, and a very well-executed conversion. I'm curious to see more from these guys. 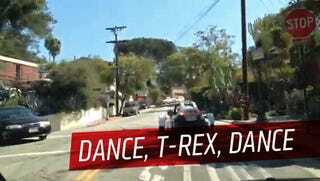 Let me be clear here: I love how bonkers the T-Rex is, and I hope they keep making crazy stuff like this. But this thing is just too impractical, too scary on the highway, and worst of all, just too damn expensive. Sure, everyone looks at you like you're 2115's Sexiest Man On Mars Colony when you pull up in it, and it can be an absolute blast in short bursts, but trying to treat it like anything approaching a useful vehicle is an exercise in face exhaust and a battered coccyx. This is not just hybrid-bashing. I have no problem with hybrids, or electric cars. Really, I don't. And I love the idea of a small, cheap hybrid. I even kind of liked the way these things looked in that weird orange color they come in. But driving it. Oh man. We normally have these press cars for a week, and that never seems like enough, but the amazing qualities of this car made that week seem like months and months of tedious, bland boring torture, or borture. This thing is the biggest four-wheeled sleeping pill ever produced by the hand of man. I tried to do a Will It Baby with it but it was just too damn boring. My wife hated it, I could barely stay awake in it, and in silver it disappears in parking lots like night ninjas do in your bedroom. Seriously, Toyota, take another crack at this one. I'm really glad I paid the cabbie to let me drive this thing, but holy crap was it scary. Partially the vehicle itself, powered by what seemed to be firecrackers in a tin can, and partially because of the traffic coming within microns of every part of you as you drive. Truck mirrors seem to have been developed by putting a reflective surface on devices designed to decapitate three-wheeler drivers. Potholes had to be forded like lakes. Little hatchbacks swarmed like baby elephants. It was bonkers. Dishonorable Mention: The Hindustan Ambassador, because, let's face it, it's built shoddily and drives like a museum exhibit, and not in a fun way. But I didn't want to fully pan it because I'm a sicko who kind of loved it. SPECIAL AWARD: My '73 Beetle. Because all of you helped me find it, and I'm still incredibly grateful. Thank you.